West Yorkshire Playhouse opens a new season with its first in-house Shakespeare production for some time. Richard III is arguably one of Shakespeare’s most brutal tragedies; a tale of jealousy and arch manipulation escalating in monstrous acts of violence, the play centres on a malcontent who will stop at nothing to gain access to the throne. 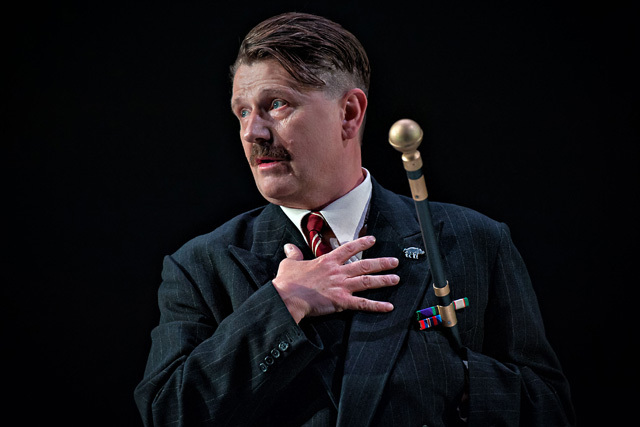 Reece Dinsdale was directed under Mark Rosenblatt for 2014’s Untold Stories to great acclaim (see review) and the collaboration again proves to be a winning formula with Dinsdale as Richard III. His king is venomous and deliciously wicked, polished in a shell of sycophantic charm. Great consideration has been made in regard to Richard’s physical afflictions which are evident but not overly on the nose; a raised heel provides a clubbed foot and a twisted gait implies a malformed spine. His left hand is constantly pocketed, nestling a drill cane which is at once a sword and second a dagger. There are shadows of colonialism and Nazism in his salutations, assisted by a costume which is fiercely militarian with hair closely cropped at the temple. A sculpted moustache also implies an underlying vanity. It is a Richard of the 20th Century, recognisable in time yet historically archaic with the gravitas to absorb the iconography of Shakespeare’s character. In many ways Dinsdale approaches the role within a domestic sphere, playing the Duke as something of a seedy uncle, a snakeoil salesman of lies who extorts his disability as a barrier during conflict. A gleeful creature of insidious opportunities, Dinsdale’s Richard is also incredibly funny; a twisted sociopath with doe-eyes yet a tight, white smile, he instantly wins over the audience despite his heinous villainy. The performance is also wildly unpredictable, at once mildly camp followed by flashes of explosive fury. It is a highly commendable portrayal which is brave, energetic and refreshingly inventive. Reece Dinsdale as Richard III. Photographer: Anthony Robling. Rosenblatt’s direction feels wholly unobtrusive, allowing the dialogue to shine with naturalistic movements that have purpose, pace and urgency. The entire thrust stage of the Quarry Theatre, which is somewhat of an awkward and vast space, is well utilized, providing a wide scope with clear sight-lines to the drama. The oncoming battle from France is staged particularly stylishly, underscored by a creeping crescent of drummers whilst Richard soliloquizes in armour that evokes the style of a straight-jacket. 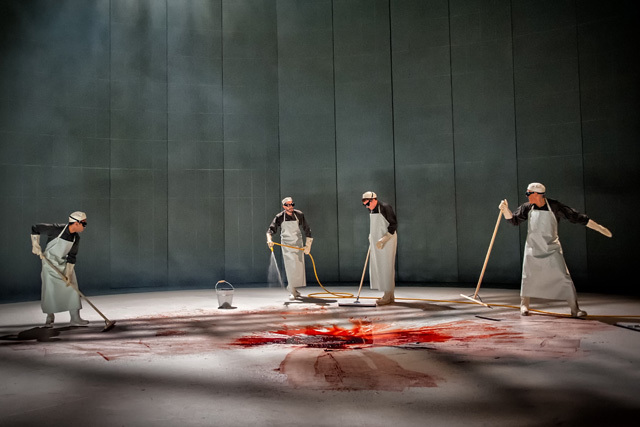 Brutal and visceral stagecraft in Richard III at West Yorkshire Playhouse. Photographer: Anthony Robling. Rosenblatt has created a Richard III which feels entirely fresh yet remains authentic to the majesty of Shakespeare’s writing. A wholly convincing world has been created in this production which provides a clarity to the storytelling and, importantly, a renewed accessibility to the text and its dense dialogue. With a mixture of styles from Victorian to present day, from World War overtones, to 1970s Post Office Telephones and hipster chinos, the times and places remain familiar yet anachronistic. However one element which remains constant is the use of a range of Northern accents which are expertly pitched. Haunting and twisted yet darkly comic, Richard III is produced as a claret-coloured comic chiller, brought to the stage with a relentless bloodlust. There is a palpable feeling of unease in its violence, with piercing grief that is countered by a devilish charm from its leading actor. A visceral winner on every level, Richard III’s greatest success is its identifiable clarity as a story with clearly drawn characters in contemporary roles, providing a tangible dynamic for Shakespeare’s dialogue to shine. A tale of treachery, pernicious and malicious intent, Richard III is a memorable and startling new take on one of the finest tragedies.